Do you own or manage a bar, pub, restaurant or club? There’s a lot to take care of. High footfall and long opening hours can prove a challenge in maintaining spotless premises and customers have high expectations of their leisure time. With so many venues to choose from clean premises are an integral part of attracting customers that want to return, and fundamental to your business success. At Happy Hands, you are in safe hands; our track record means that we are well-placed to advise you regarding your cleaning schedule to ensure the smooth running of your business, whether it be a bustling pub, bar/club, or exclusive restaurant . We also understand the implications of the highest levels of hygiene throughout your premises; not only for the comfort of your clientele but in protecting your reputation. Perhaps the schedule you are currently operating could be improved upon and represent a better return for your budget? Our professional team is fully trained in all aspects of leisure & hospitality cleaning. We ensure wherever possible that you will be looked after by the same operatives that are familiar with the needs of your premises giving you the confidence that all the agreed areas are being attended to and leaving you free to manage the many other aspects of your business. 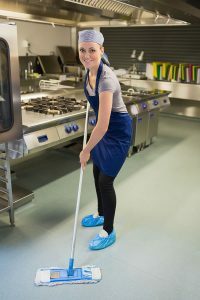 As well as inside and outside bar & restaurant cleaning services we provide back of house cleans giving you peace of mind that you are meeting the highest hygiene standards in your food preparation areas. It’s something that your staff will appreciate as well as your customers. As your cleaning partner we will be pro-active in making suggestions that will positively impact your business. Call us now for a no obligation quote and to find out how we can make a difference. Call 01992 470 222 or email paul@happy-hands.biz.